The Falcon Heavy has flown before, but now it’s got a payload that matters and competitors nipping at its heels. It’s the first of a new generation of launch vehicles that can take huge payloads to space cheaply and frequently, opening up a new frontier in the space race. Watch it lift off Sunday afternoon (we’ll post a reminder). On the 7th, Falcon Heavy will fly for the first time since its inaugural test last February, delivering the now-infamous Tesla Roadster and “Starman” into a trajectory that has taken them past Mars. That successful launch garnered SpaceX its first customer for the system, and Sunday’s launch will take Arabsat-6A, a Lockheed-built communications satellite, into geosynchronous orbit. A static fire today went well, so weather permitting takeoff should Notably, SpaceX CEO Elon Musk pointed out on Twitter that the Block 5 Falcon Heavy (that is to say, the production revision as opposed to the test version we saw) has 10 percent more thrust capacity than before, which also translates to a better safety margin if using less than its maximum. So why exactly is Falcon Heavy important? After all, launch vehicles capable of putting a hundred a hundred tons of material into or beyond orbit have existed since Apollo. Simply speaking, the difference comes down to price. Putting anything into space is difficult enough. But heavier payloads get exponentially more difficult to lift: The equations we’ve known for a century or so governing how much lift is needed to get a certain amount of mass into orbit, and how much fuel is needed in turn to generate that lift, are clear on this. As advances in materials and rocket engines have progressed, they have disproportionately benefited small and medium launch vehicles. Combined with the decreasing size of satellite payloads, this has created a new and promising era for small craft, which can be launched in great numbers — as we’re seeing in the many promises to deploy constellations thousands strong. Efficiently made disposables like Rocket Lab’s Electron and reusable ones like the Falcon 9 have begun the process of pushing the price of small and medium-size launches down to a fraction of what they once were. But heavy and super-heavy launch vehicles have remained phenomenally expensive due to the fundamentally difficult nature of building these physics-defying monsters. So while putting 10 tons in orbit has gotten cheap enough that startups can do it, putting 100 tons up there remains the province of global superpowers. Falcon Heavy is really the first to start a similar price shift for this category, cutting the cost of putting large payloads up by a huge amount. And while an estimated price tag of around $100 million per launch is hardly pocket change, it’s a whole lot less than the $350-$500 million a Delta IV might cost. That level of savings can transform an entire space program. NASA could add an entire planetary exploration mission to its budget for the price difference of one launch alone. This math may not always add up (the Delta IV’s excellent launch record rightly commands a premium) but it’s impossible to ignore. 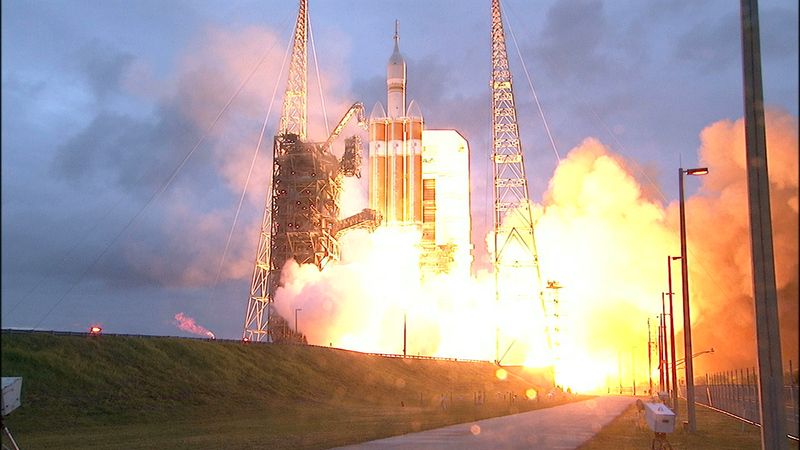 A Delta IV takes off in 2016. The market for heavy launches is, like that for small ones, heavily supply-limited. Governments and major corporations are lined up for years to put major items into or beyond orbit. SpaceX will sell room on Falcon Heavy systems as fast as it can make them. And because its side stages are reusable, it can make them faster than others can make theirs! It stands to make a huge amount of money while also massively empowering the global space community. For now, though, Falcon Heavy is an anomaly, but a welcome one. Lowering the cost and complexity of more distant and ambitious space projects is an exciting prospect, and Sunday’s launch is one of the first indications that we are witnessing that change take place.